Riding mountain bikes or downhill bikes is synonymous with speed and maybe a little bit of danger. This isn’t the type of speed you attain when riding road or racing bikes, this is muddy, wet and obstacle-ridden trails through deep forests. This situation calls for hard and fast stopping ability at all times. If you don’t have this topping power on your downhill mountain bike brakes then you may as well call yourself an ambulance now. When looking at the mountain bike and trail scene now you’ll be hard-pressed to find a downhill rider without two solid hydraulic brakes. They are the only thing reliable enough to always give you the power you need whenever you need it. Mechanical brakes have been left for the cheaper or kids mountain bikes, they just aren’t reliable enough and the quality isn’t high enough for the heat and stress they’ll be put through when riding all day. It’s unlikely to see hydraulic brakes used on any other sort of bike than a mountain bike or downhill bike. 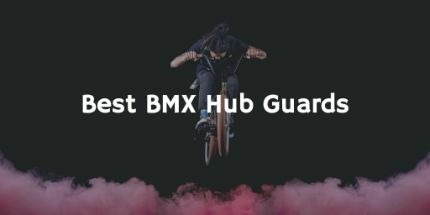 BMX bikes rarely have brakes and if they do they are always u-brakes fixed to the rim. Most other bikes like road bikes or hybrids will only have rim brakes or mechanical disc brakes. They just don’t need the stopping power when doing this sort of riding. To put it as simple as possible, hydraulic mountain bike brakes use levers to push fluid through a sealed hose, thus pushing two pads against a metal rotor that’s attached to a wheel. Unlike mechanical brakes that only apply equal pressure from the lever down to the brake, hydraulic brakes can apply up to three times the force on the disc as is applied on the brake lever. Now if you’ve never ridden a bike with hydraulic brakes have a look at a rider that does use them. It’s very likely that you’ll only ever see them use one or two fingers on their brakes, the use of any more just isn’t necessary. 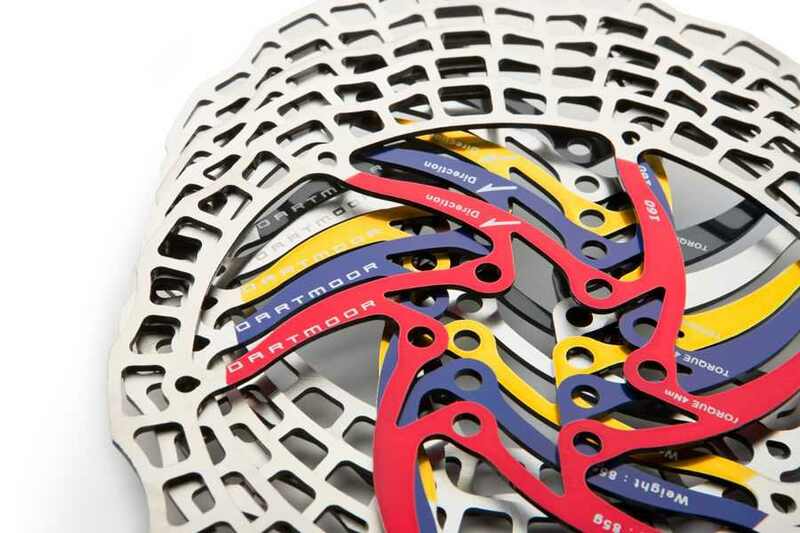 The fact that this is all the effort needed to stop dead makes hydraulic brakes perfect for downhill mountain bikes, dirt jump bikes and regular all-around mountain bikes. You can keep nearly all of your hand on your grips, thus exponentially increasing your grip and stability. I don’t think I’ve ever ridden a mountain bike or downhill track without it being muddy or at least a little bit wet. This is another reason why hydraulic brakes fit in this industry so well. Due to the nature of the brake fluid, the brakes and hoses need to be totally sealed, giving mud, dust and water absolutely no way in. The only way water can affect your braking now is in the discs but the insane stopping force renders this problem pretty obsolete. Note: The braking power in hydraulic brakes is amazing but DO NOT get any oil or similar liquids anywhere near the discs. You won’t be able to stop properly for ages. Mineral and DOT fluid is the most common brake fluid found in today's hydraulic braking systems. Mineral oil is inert and can’t cause any damage although DOT braking fluid is corrosive to frame paint it has a much higher boiling point than mineral fluid meaning it should last longer in your brakes. If you are replacing brake fluid on your own bike then spend some time and ensure you're totally confident you’re using the right type before you bleed your hydraulic brakes. Using the wrong type of brake fluid can really ruin your brake seals and other parts of your brake. Fluid incompatibility can also cause swelling and corrosion in your seals and O-rings. After a lot of riding, or even just a little bit of riding in winter, brake pistons, callipers and discs can become very dull and ineffectively. It’s very easy to replace brake pads, clean your pistons and callipers and realign your rotor with your pads. To start this process remove your wheels. To do this on the vast majority of mountain bikes you will need to simply unscrew a quick release bolt and slide it out. No tools required and much easier than a BMX wheel. It is important to remember that while your wheels are off your bike you should be careful not to press your brake levers all the way in or your pistons will close together and not part without your intervention. To get your brake pads apart after doing this, because I can guarantee that you’ll do it at some point, is to use either a wide flat headed screwdriver or a specialised piston press tool. 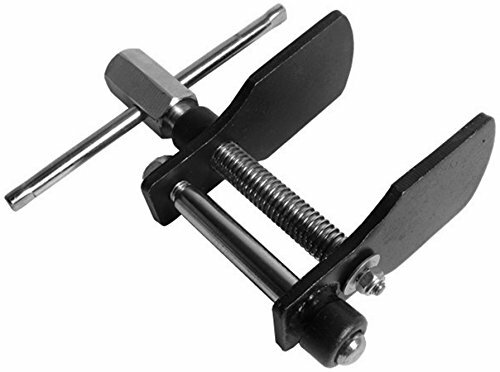 If you can’t get your hands on a piston press tool then a flat headed screwdriver will work perfectly on your mountain bike brakes. Simply wrap the end of your screwdriver with some kitchen towel and push it carefully between your pistons. After you’ve got it a decent way in slowly turn it, pushing the pistons back to their original places. Now we have the wheels off we can get onto cleaning the brake callipers, pistons and pads. If you’ve been riding your bike for a while without cleaning your brakes then it’ll probably be a good idea to swap out your brake pads. Doing this is easy. Simply buy the right pads online or at your nearest mountain bike store and then swap them with the old pads in your callipers. As you probably know, brake pads are magnetically attached to their specific pistons. All you have to do to take them out is push them towards the centre and they should lose their pull. You can then pull them upwards and out of the calliper. If you manage to get your brake pads out of your callipers you won’t have any problem getting new ones back in. It’s exactly the same method in reverse. Now we have the pads out, make sure your pistons are pushed as far out as possible. Use the same screwdriver or piston press method to do this. Then get some kitchen towel or a cloth and use a degreaser to wipe as much of the insides of your calliper as possible. After extensive and tough riding it becomes very important to keep your callipers clean and lubricated. There is a lot of junk that can find a home inside your callipers. Cleaning this out will help your discs to spin much easier, giving you even more unneeded stopping power. I know I’ve said to make sure you don’t do this already but now you need to clean the sides of your pistons and to do this you will need to press your brake lever slightly. Push it just enough to see some of the sides of each piston. You can then use the same method to clean these pistons. Once you’re happy with the state of your pistons you can push you pistons back to their original state and then start to put your brakes back together. Brake bleeding is an important but kind of difficult mountain bike mechanical task. Bleeding your brakes properly will keep them in great condition while also keeping the likelihood of malfunction low. If you haven’t already got a hydraulic brake bleeding kit, I highly advise you to buy one and it’s a good idea to buy the branded one for your brakes. Shimano is one of the leaders in hydraulic mountain bike brakes. 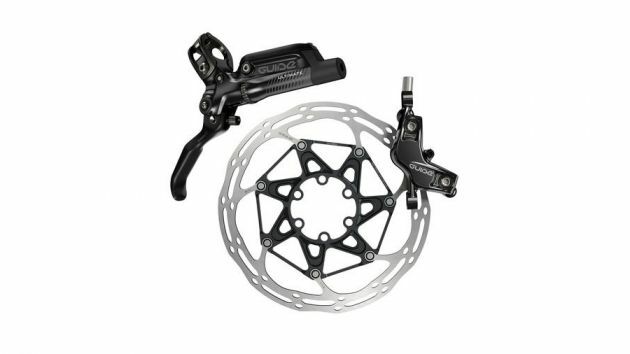 It wouldn’t be hard to fill this list with amazing, high-quality brakes made by Shimano. Since I’ve had to make the hard decision of only choosing a couple of Shimano mountain bike brakes, the XTR BR M9020 Trail is a great choice. As is evident from the product image, these downhill brakes, made from a super lightweight mono one-piece body, are nicely ergonomic, powerful and compact. The styling has definitely been thought about extensively. Shimano has gone a little different from most other hydraulic brake manufacturers. The brake lever has been extended out a little farther than normal, with the actual lever having a steep angle pointing forward, being much more suitable for one or two fingered braking. 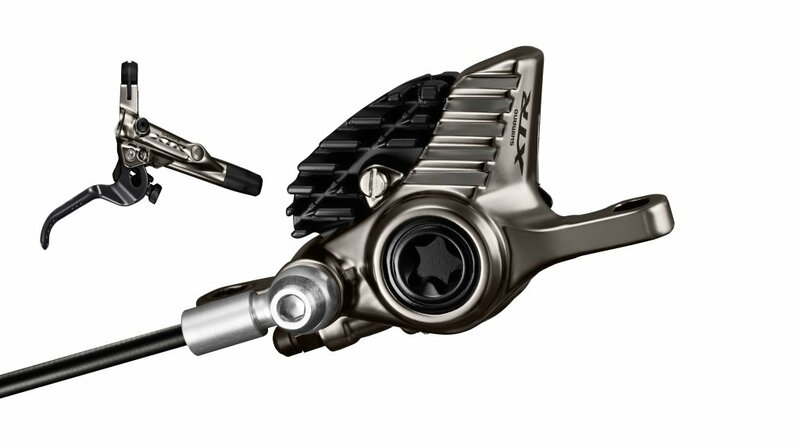 This brake has been primarily designed for ultimate optimisation and adjustability on-the-fly. 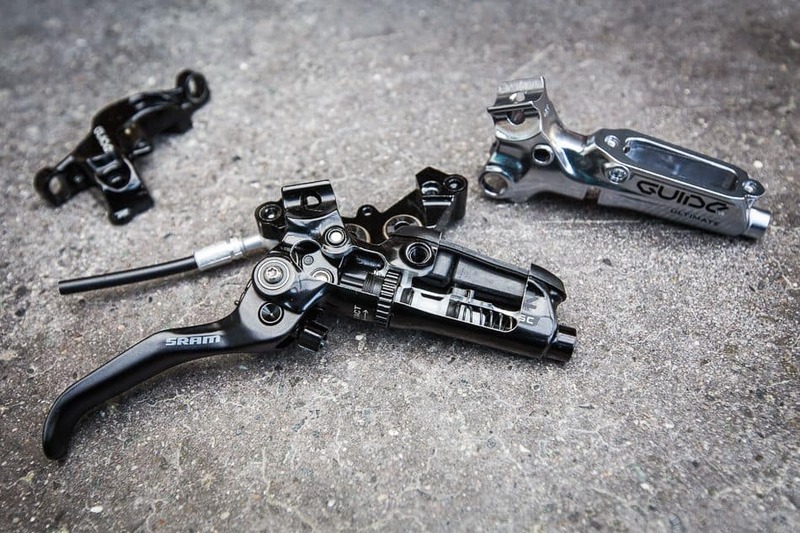 Shimano has some of the best innovative technologies on the hydraulic brake market making it very unlikely you’ll ever be disappointed with the weight and power achieved by Shimano’s designers. These mountain bike callipers come equipped with oversized 22mm glass fibre phenolic pistons that have been optimised to cope with extreme heat, keep the weight off and also be extremely stiff. This brake can be used for a lot longer and harder than most other brakes without failing or overheating. As well as being oversized glass fibre phenolic, these brakes have an opposed 2-piston design. This can increase braking control tremendously and will also reduce leading effect. It isn’t just the callipers and brake lever designs and technology that make a hydraulic brake amazing. If you have rubbish pads then you’re not going to get good stopping power for a long time. 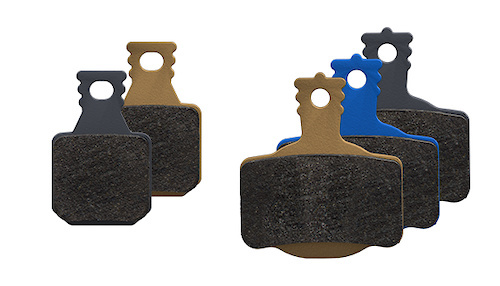 Shimano recommends using Ice-Tech pads that are available in resin or sintered compound. Shimano has also developed an optional aluminium radiation fin that can be fitted in order to reduce brake and rotor temperature by up to 50°C. The levers on this Shimano brake are just as effortlessly elegant as the calliper and just as well designed too. The brake has been designed so as soon as the lever is pulled the pads start closing onto the rotor. The reaction time between each action has been reduced to minute timescales. When I ride with hydraulic brakes I like to ride with one finger on each brake lever at all times. Doing this means that sometimes I accidentally pull the lever slight amounts by accident. The M9020 brakes let you fine-tune the exact amount the brake engages when the lever is pulled. 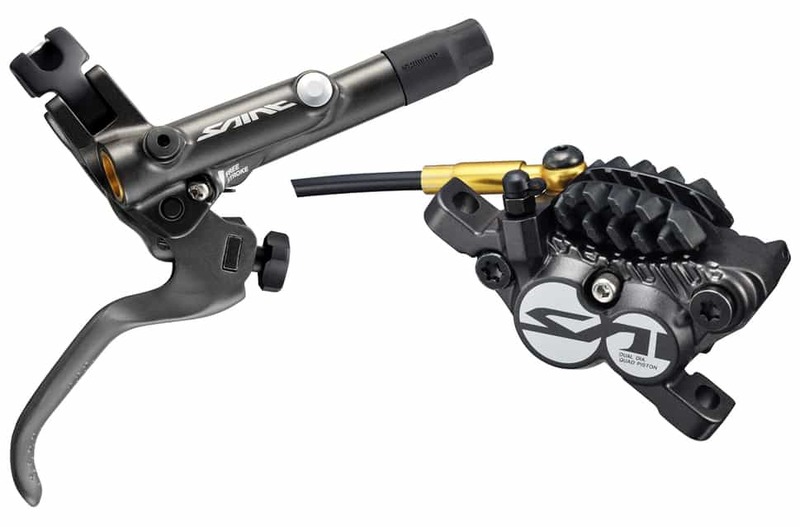 This Sram Guide Ultimate downhill hydraulic disc brake is relatively new and definitely has some of the newest technologies possible for a hydraulic brake. This is a special 4-piston 24 calliper with a SwingLink lever cam, a carbon lever blade and somehow still only weighs in at 360 grams. It’s actually quite rare for hydraulic brakes to have four pistons, normally you will only be graced with two. Since the callipers are relatively small you can actually see the two circular areas in the middle where the two pistons are positioned on either side. The Sram Guide brake has been designed to be just as strong and powerful as the other power players in the industry but they are also working towards some amazing heat management capabilities. Sram believes that there’s no point in having strong, light and powerful brakes if they overheat within five minutes of riding. They have been working to keep your brake pads and rotors as cold as possible. You can see just some of the ideas that Sram have put into practice on these images here. The pads are much wider than is necessary and compared to the size of the callipers they are nearly as big. This is great for spreading friction over a much larger surface. This newly designed calliper incorporates a newly re-designed seal and smaller piston interface. This is done to make bleeding and setting up the brakes much easier than it was before. For a long time, Hope has been one of my absolute favourite bike manufacturers. The quality of their work is just incredible and I have never found a fault with their products. Hope haven’t ever built a full bike, instead, they have focussed vast amounts of effort into designing parts for mountain bikes, downhill bikes and BMX bikes. 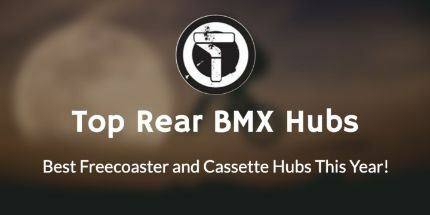 If you’ve never heard of Hope before, they are most well known for their high-quality BMX hubs and mountain bike brakes. Just to show how intricate the design and manufacturing process is; in this model of the Hope Stealth brake Hope have slightly shortened the lever pivot. This immediately translates into a 15% increase in braking power. This brake has inherited many aspects of the Hope Mini with a few extra precision grams stripped off without any harm to the power or strength of the brake. Although it’s pretty similar to most of the other brakes on this list it’s worth mentioning. The super lightweight design has been CNC machined out of a solid single billet of 2014 T6 aircraft spec aluminium alloy. This seamless, solid design gives you a much smoother and progressive feel while riding and braking. The M4 calliper is a product of the very latest in Finite Element Analysis. This software has been used to reduce unnecessary weight, improve the slim aesthetics and also create a Superlite calliper. Due to the amount of force and modulation of this braking system it fits the riding style of XC riders perfectly. Cross Country riders will have the power and stability to cover over a thousand miles before even needing to consider cleaning, alerting or bleeding these brakes. They are truly an incredible piece of craftsmanship. It’s probably no surprise to anybody that Hope has also put a lot of thought and design into great brake rotors too. As you can see from the image, Hope has designed a different style of brake rotor than many other brands, they call it a floating rotor. The inner is made of aluminium and designed to be strong while still being able to stay cool. The outer section is made from a specialised steel braking surface and it’s actually quite clever the way they have fit these two materials together. Basically, steel is a very good material for braking as it is super strong and can withstand friction and heat much better than other materials. The aluminium in the centre has been added to stop the fast spread of heat from the steel part towards the centre, effectively protecting the hub from too much heat. As I said at the start of this article, it was very hard not to fill this list with Shimano brakes. This braking system has been primarily designed with braking performance and heat dissipation in mind. The state of the art Ice Technology used in the M9020 has also been used here and that just goes to show how advanced this brake is. 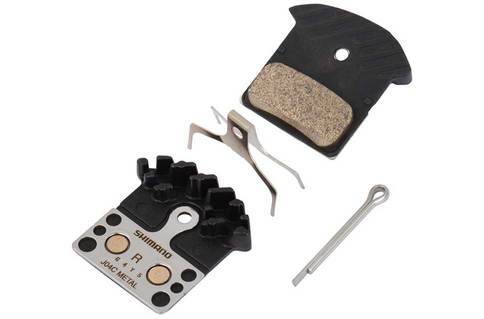 As before, Shimano has used their specifically designed finned brake pads and an innovative finned rotor. Operating temperatures have been reduced significantly through the increased rotor surface area and finned brake pads, thus increasing stopping power by 20%. You’ll have to do some serious riding to overheat these brakes. The M820 brakes feature a great set of self-insulating ceramic pistons with a three-layer rotor construction. Now, some people don’t like brakes with levers that extend significantly outwards from the bars. These brakes do extend a lot from the bars of the bike and even feature an improved ergonomic brake lever to make it much harder for your fingers to lose your levers. 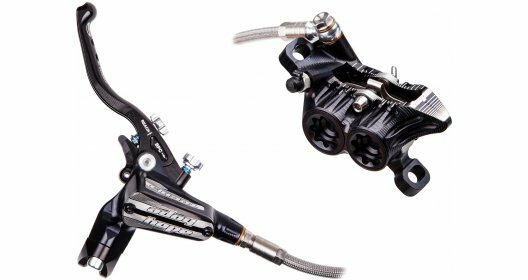 Unlike a lot of other brakes on this list, this Shimano downhill mountain bike brake features a one-way bleed for very easy and clean servicing. I love the style of these brakes. The lever extends much less from the bars. I admit I am unsure if there is an advantage to this shape of the brake but I definitely prefer it when riding dirt jump bikes. This is another four piston, dual diameter brake with SwingLink technology. With this brake, you will get silky-smooth modulation and a better braking feel than you’ve ever felt. Sram has also added a tool-free reach adjustment to give you an even easier life. If you don’t know what that means; basically you can change the distance of the brake lever from the bars of the bike. If you have long fingers or prefer braking with a different section of your finger than normal, this will be a great feature for you. 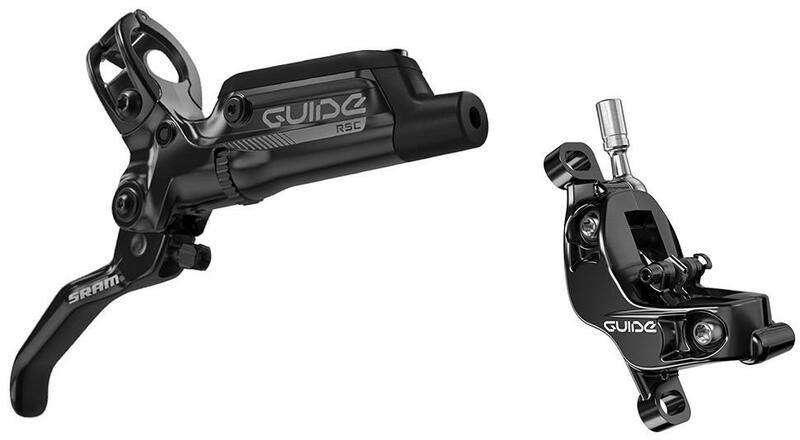 The Sram guide brake also includes a couple of interesting technologies only recently released. One of these is Contact Point Adjustment. All the way back to childhood and mechanical rim brakes it has been possible to adjust the power of your brakes at certain points of the lever throw. It was never very reliable to do this on mechanical brakes but on these brakes, you can measure it down to the millimetre. SRAM has a great range of integrated mounts for things like brakes, gears and suspension, making these brakes very easy to fit onto many different frames, forks and mounting positions. These brake levers are also ambidextrous. This can be useful for a variety of riders. I am in the UK, which means that my front brake is on the right and my back brake is on the left. This is the opposite to foreign brakes and means in some place the brake will have to be on the other side of the bars. 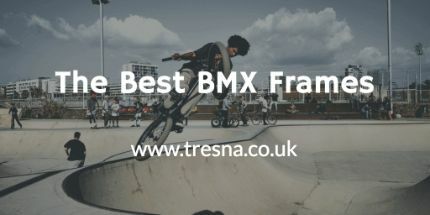 It is also a regular occurrence that dirt jump bike riders will take their front brake off and switch their back brake over to the right-hand side of the bars. 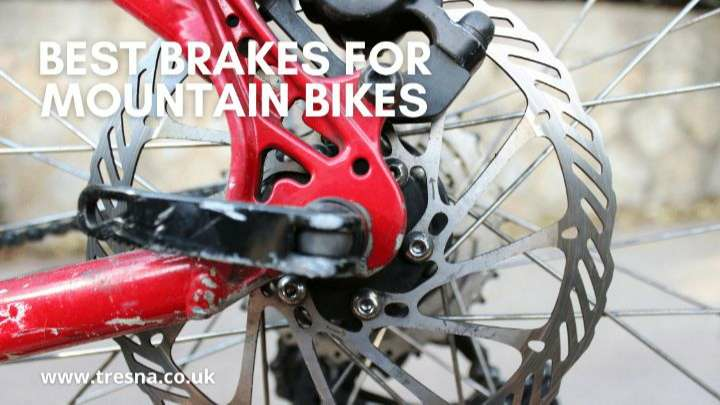 To summarise, I would only really recommend these brakes to the most avid of trail riders, there are many cheaper alternatives that are suitable for most other riders. These brakes feature so many extra small details that set them outstanding ability to maintain consistent control and never-ending grip whilst also keeping cool. The abilities of these brakes are only really challenged by professional downhill mountain bike riders. You’ve probably already got bored of me saying how much I like Hope and their products earlier in this article. Unfortunately, I’m going to have to say it a few more times. Their craftsmanship is just unwavering. Just like always, the Hope Tech 3 V4 has been worked on a lot. This new disc brake improves on handlebar integration and ergonomics. The new four-piston system has improved braking power by 5% over the Hope Tech Evo master cylinder. The popular reach and bite control feature used by some of the other brakes on this list has been designed to perfection by Hope. The piston is actuated by a cam and a roller system any free play or initial friction in the brake. Hope are notorious for their eccentric colours and perfectly machined metal. They definitely haven’t stopped with this new brake. Using the classic split clamp design hope have CNC machined their one-piece calliper from a solid billet of crazy strong aircraft spec aluminium alloy. Aircraft grade aluminium is only really used in the most expensive braking systems and will be used to increase calliper stiffness while also expanding the brake pad surface area. This extra area will offer much better heat management. Keeping your pads cool and having an accurately positioned pad and calliper will increase the life of your pads. This is important considering the amount it costs for new pads. 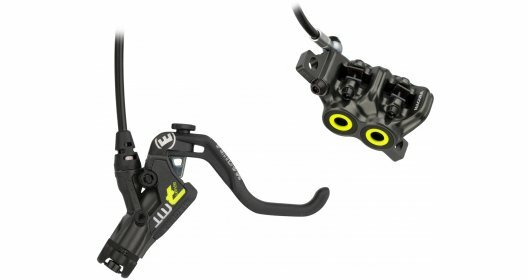 Magura’s new carbon disc brake set sits at the top of the trail riding brake list. 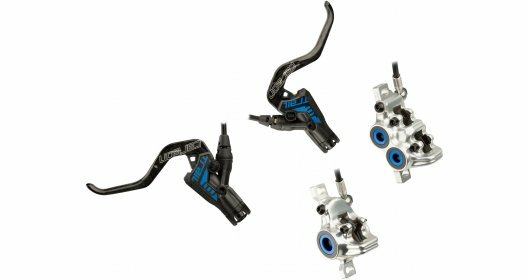 For better modulation, Magura has developed the front calliper to have four pistons while still keeping the rear with two pistons. It may seem a little odd to have a different amount of pistons on each calliper but Magura does have a reason. Many of their employees were already mixing the MT7 four piston and the MT8 two piston together to balance the forces their brakes were outputting and to enhance modulation. Magura claims that the difference between the front and rear brakes actually closely match the traction produced by the wheels respectively. The rear calliper has also been enlarged to 180mm. 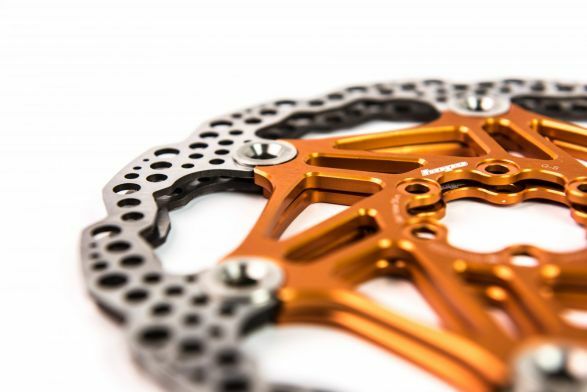 This is to add better cooling to the pads and rotors since most trail and downhill riders will ride the brakes a little in order to give them that extra control and immediate power. As you may have already guessed, you will need different pads for the front and rear brakes. In order to equal out the braking force between the front and rear callipers, the rear pistons have been made a little smaller, requiring a different type of pad. Magura actually offers different types of pads for both the front and rear brakes. As you can see from the image below; grey pads are their standard performance pads with blue being a little softer for extra comfort and gold being the strongest and grippies, unsurprisingly called Race pads. 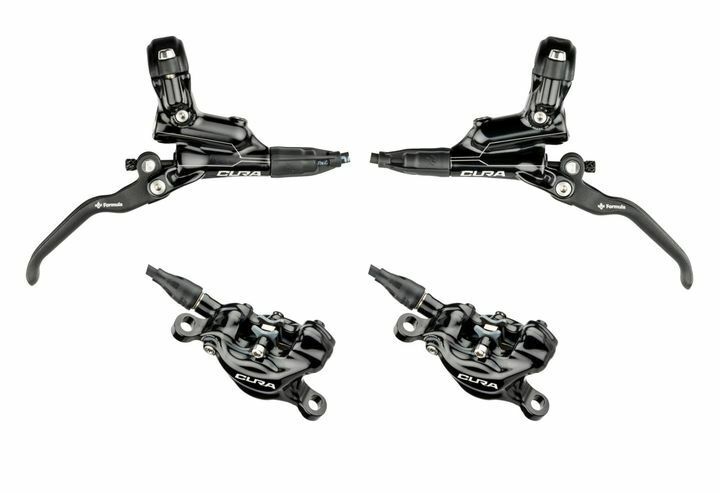 Considering the prices of some of the other brakes on this list, the Formula Cura mountain bike brakes are actually relatively cheap. These brakes aren’t designed for the absolute professionals like some of the others on this list but they are very good. What you gain in a cheaper price you will also lose a little less adequate power and less adjustment ability. With this new brake, you will also be getting Formula’s first brake with mineral oil instead of DOT fluid. Formula has been careful to set this brake up to give the rider great comfort when riding, the downside of this is that without accurate setup on your part and to give you scuff free riding and with the added feature of early pad contact, you’re definitely going to be running through a few sets of pads. 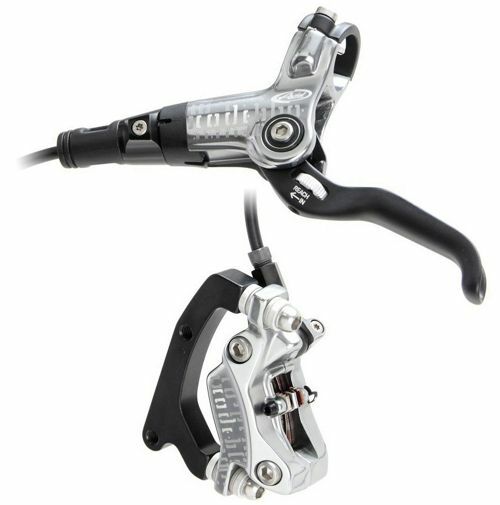 If you’re looking for a cheaper or lighter brake that still has amazing power and a great name attached to it then this Formula mountain bike brake could be perfect for you. Being priced at just over £100 and weighing about 400g you will be getting great value for money even if it’s not at the top of the list. The Magura MT7 is the four piston calliper that’s used for the front wheel on the Magura MT set. This brake is used on the front wheel since it’s incredibly powerful but unfortunately with this power comes some significantly blunt delivery of power. Not having absolute control over the power your brakes can make it much harder to control and anticipate braking force needed when riding. If you’re looking for a powerhouse that will stop you instantly but aren’t that concerned with finesse or control then this is the brake for you. Dirt Jump riders, high-speed enduro riders and amateur or intermediate trail riders will find the best use for the MT7 disc brake. 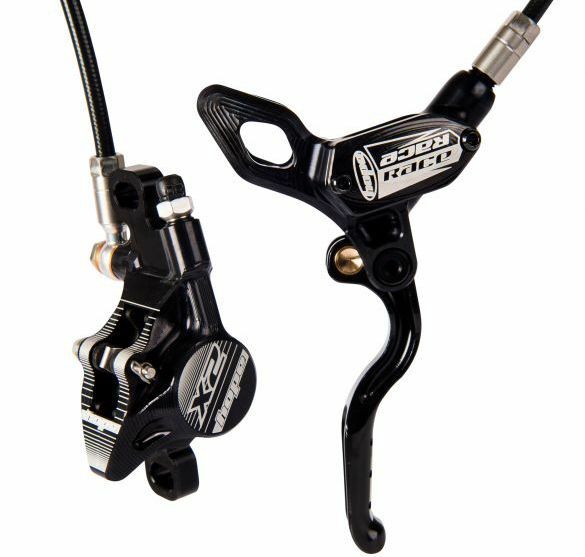 Dirt jump riders rarely need technical stopping ability and trail riders, while can be very technical and have a need for control won’t be hindered by this brake unless they are very advanced. 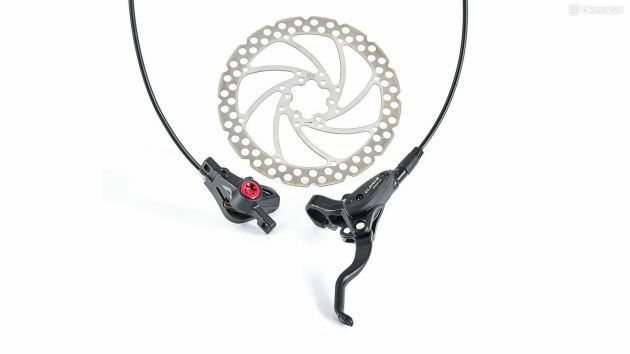 Magura actually developed this brake for high-speed enduro bike riders so I wouldn’t be surprised if it fit the riding style of enduro very nicely. Downhill riders would be better suited to using the Magura MT Trail set and so only having this on their front wheel. Technical riding where the back brake will be used 90% of the time is not suitable for this model, the wooden feel and the engagement point will be unreliable in giving you enough control. 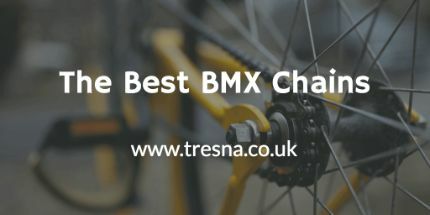 When I first wrote this post I made sure to include some of the best selling and most popular mountain bike disc brakes. Sram made up a fair few of these brakes. That’s why I’m confident it’s a good idea to include the Avid Code brakes on this update for the best MTB brakes of 2019. Sram now own a fair few mountain bike brands. 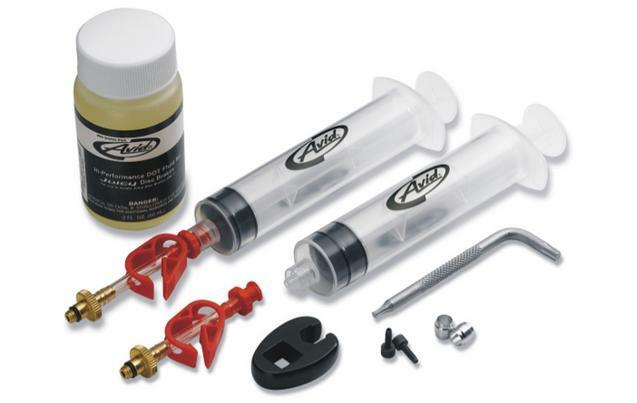 They provide riders with the top products for various parts of your mountain bike. From all your main bike parts in the Sram brand, to brilliant mountain bike forks by Rock Shox and now obviously Avid. This part of the company is primarily dedicated to MTB brakes. Over many years I have developed a love for Avid brakes. I ride a lot of dirt jump bikes and the sleek thinner design of the Avid brakes are great for a slimmed down dirt jump bike designs. They rarely get in the way of your fingers and can handle themselves much better when falling off. The Code model has been developed the tougher riders. Downhill and Enduro riders should take a good look at this brake if they’re thinking of switching or upgrading. As I said before, the sleek design helps with strength and boasts a low weight. At the same time, the caliper hugs 4 pistons. This provides the top performance possible whilst the TaperBore technology and sealed bearings will definitely put your mind at ease no matter how hard or fast you’re riding. 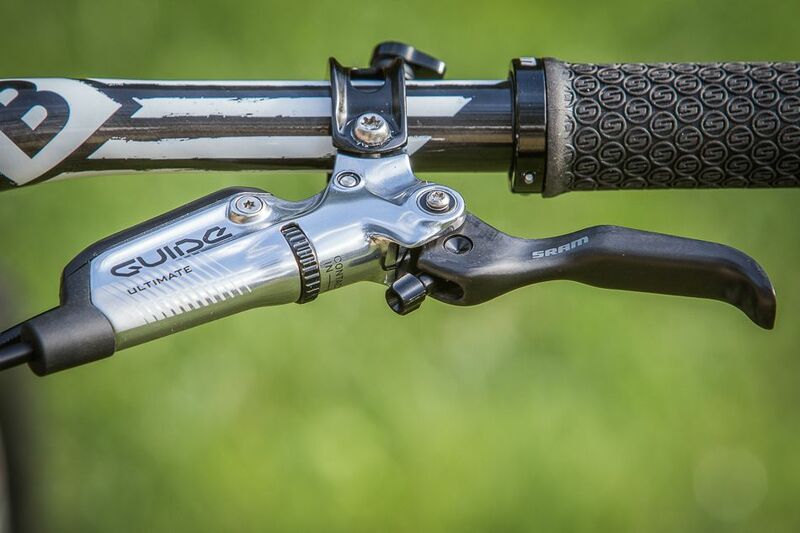 TaperBore: This technology is the closure system used in this brake and other that saves weight, allows the design to look super sleek and also improves feedback through the levers. 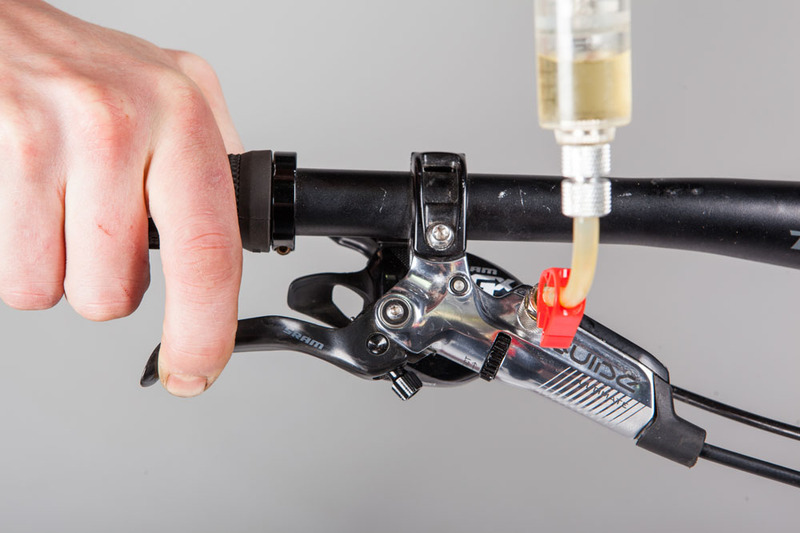 As well as the patent pending TaperBore, Avid has also included Reversible break-away levers and split clamps. These features really do help you get the best out of your brakes. If you’re looking for a cheaper hydraulic brake that is still popular and has proven to be a good brake then you can’t go wrong with the Clarks M2 brake. Being sold at a third of the price of a lot of the brakes on this list, the M2 has truly been designed with the average user in mind and not just the profits of the company. The brake has been designed to accept a much larger variation of parts than other brakes. For example, you could replace the default pads for the best Shimano brake pads and instantly upgrade your brakes while still being much cheaper than most other complete brake sets. I would recommend that you replace your pads to the superior Shimano pattern pads as soon as you get the brakes or at least the first time you need a replacement. When tested, the default brakes and pads don’t even produce half the deceleration power of brakes like the Shimano or Sram Guide. The two piston design means that unfortunately you’ll get much less braking power than the more advanced 4 piston designs. The modulation though is very good. Clarks have eliminated a good amount of heat issues with this development in modulation. I’m not going to argue with anyone that says the calliper and lever system of a braking setup is the most important part, but I will have to say that using a low quality or the wrong rotor will significantly hinder your brakes power and cooling potential. The following brake discs aren’t considered the best on the market (that will be an entirely separate post) but they are some of my favourites. The Braking Disc Wave S3 isn’t widely known like most of the brands featured in this article. Despite this, I think they’ve created an amazing product here. 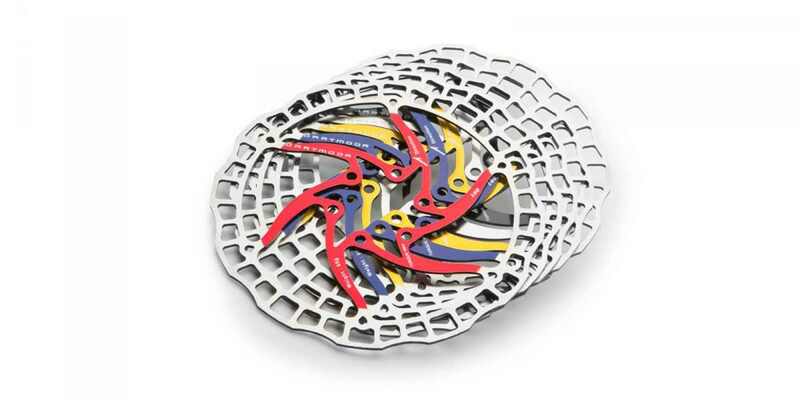 This semi-floating design isn’t common on the disc brake rotor market though there are good reasons for it being used. Fixed rotors have great integrity and are equally strong throughout the whole chunk of metal. Floating rotors, on the other hand, have great warping resistance and cooling capabilities. This brake rotor has used both these together in order to hopefully get the best of both worlds. For years I only ever considered the shape and pattern of disc brakes a nice piece of art but I soon found out that there was always a lot of thought that went into the design of the rotor. The Wave S3 rotor has been designed in such a way as to retain great strength whenever significant forces are induced in any direction and also keep the weight and heat dispersion optimal. 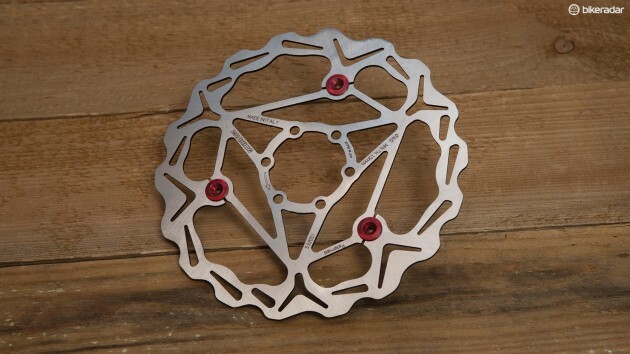 The Dartmoor Nano Brake Rotor is another great one that I’ve unfortunately never had the pleasure of riding. This is a fixed, six bolt rotor with a minimalistic but gorgeous design. When looking at this rotor you almost feel like it wouldn’t work due to the tiny amount of metal they actually use. This is one of the lightest disc brake rotors on the market today, made from stainless steel and the most attractive point? Well, it’s obviously temperature and abrasion resistance. There is just such so much ventilation that there’s almost nowhere for any heat to store. Hope mainly make floating, six-bolt rotors and they’re great. As mentioned in a previous section of this article, Hope make the inside and outside of different materials. One material for strength and another to keep the heat down. Hope floating rotors are amazing when being used with a Hope braking set but if you’re wanting to use a different hydraulic brake calliper then be careful as some rotors have been known to rub.